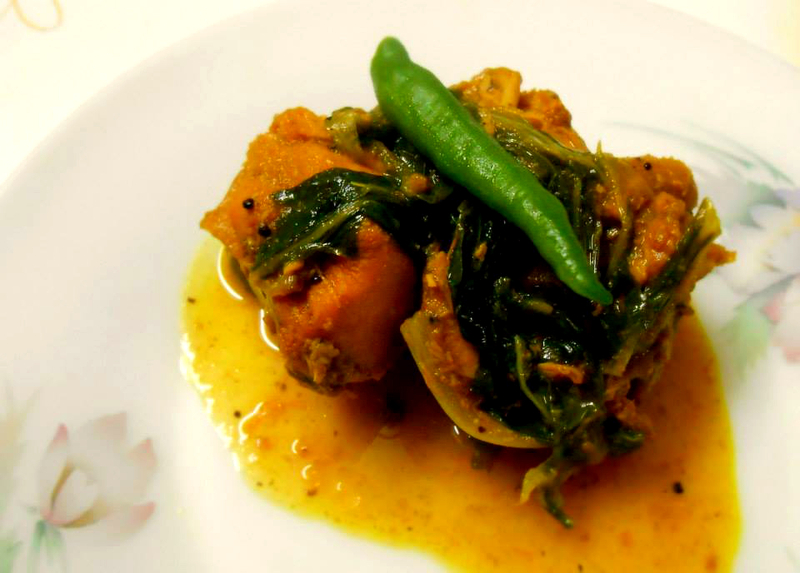 Chicken curry with mustard greens or murgi lai xaak is purely an Assamese dish, traditional and rustic. Easy to cook and easy on the stomach too. I am sure, all those familiar with Assamese cuisine would vouch for its unique taste. There exists a more popular version- pork with mustard greens and this one is eaten almost in all of North-Eastern India. The reason for its popularity is that mustard greens are abundant in the region. Moreover, our cuisine being less spicy as compared to other Indian cuisines largely depends on vegetables and herbs for flavour. So the mustard greens when used in the curry give a pungent flavour to the gravy and the leaves soak up the extra oil and spices to balance the taste and thickness of the gravy. If you wish to try this recipe and find the taste & scent of the greens overpowering, just add more spices to bring it down. But the original dish is cooked with almost no spices except for chillies, ginger and garlic. Here, in Helsinki, since I don’t often find mustard greens, I use other types of salad leaves as well. To cook this, I followed the same process but with some twists. I added onions, mustard seeds, black pepper and coriander leaves for that extra fresh flavour. I love curry on everything it’s so delicious and flavorful! Yes, we all love curry.Thanks for Reading.